Your pet is part of the family! Do you live in Bristol and need a diligent dog walker, company for your cat or your ferret fed? Come rain or shine is Bristol's premier dog walking and pet homecare service. Your pet is part of the family. This is why I offer a service full of fuss and love. 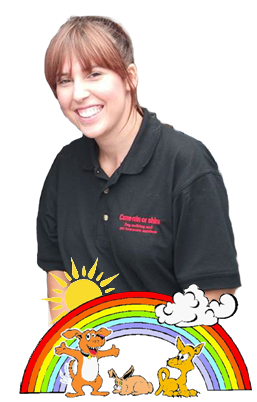 Please ring Leanne for more information or to enquire on a range of fully insured services for your pet. Solo and Group Dog WalkingQuality hour long dog walks around Bristol tailored for your dogs fitness levels. I love walking dogs around Bristol! Dog Day Care and Home Visits Attending to your pets needs throughout the day with the extra care and attention to ensure they enjoy it! Door to Door Pet TaxiA fully insured care service that can accomodate owners as well as pets in my insulated van around Bristol. Cat and Small Pet ServiceWhilst you are out I will cater to your pets needs whatever they may be. Tender loving care makes all the difference! More about cat and small pet care. your particular needs. I will do my utmost to help. Leanne is a fully insured pet care professional providing dog walking and pet sitting services to all of Bristol's dogs, cats and small pets. We think Leanne has been doing a really good job with our Spinger Spaniel, Ted. He is always very calm and tired after his walks with her and I think that her diary updates on where he has been and who he has been playing with are a really personal touch. My dog Chico has frequently stayed overnight in Leanne’s care and this has been an exceptional arrangement as he participates in family life rather than being in a kennel. Leanne is totally reliable and the welfare of the dogs is her key consideration. She is extremely kind, caring and very easy to get on with. It is evident from Chico's reaction when he sees Leanne, just what a wonderful time he enjoys when out with her and other dogs. I would recommend Leanne very highly. I would like to thank you for the excellent dog walking service that you provide. Over the past few months since you started to walk Harry he is noticeably happier. We know that he really enjoys his walk and the company he gets from you and the other dogs in your care. I have no hesitation in recommending your services to others, in particular confirming that you are professional, trustworthy and reliable. Many thanks for walking Harry. Copyright © 2010-2019 Come Rain or Shine - All rights reserved.